As consumers continue with their love of mobile phones, it’s critical for businesses to understand the various types of “mobile conversions” that will occur, eg., phone calls, store visits, purchases and more. Over 6000 mobile searches were analyzed in a study by Google and Nielsen with some amazing findings that should convince every business why mobile is important. Our smartphones are always with us and always on anytime and anywhere. Because of this, people literally expect information and the ability to search for it to be just a fingertip away. People turn to mobile devices constantly throughout the day to find information because of it’s speed and convenience with over 77% of mobile searches occurring at home or work. With this always on society, marketers need to make sure their mobile strategies will reach consumers during an on-the-go context. 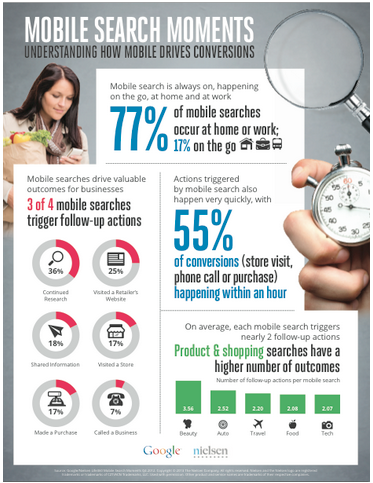 3 out of 4 mobile searches result in an action – ranging from additional research (36%), a purchase (17%), or phone call (7%). On average mobile searches will trigger two actions so marketers must assess the various ways consumers convert, both on and offline and implement accordingly. Mobile searchers also act quickly, in fact 55% happen within an hour. This immediacy effect is due to closer proximity to a business and purchase but mobile consumers are closer to that crucial decision making process that drives a conversion. 45% of searches are conducted to assist that decision which jumps to 66% when happening at the establishment. And while using mobile search to help make a decision, they’re more likely to convert. Marketers must ensure their online mobile presence during these search activities, while also creating experiences relevant to the immediacy. Specific context, like location and time of day is strongly tied to mobile searches. For instance, shopping searches are twice likely to be done in-store. Mobile searches made in-store are great opportunities for merchants to reach a consumer by offering mobile specific offers compelling them to take action. And with 55% of mobile consumers likely to notice ads or promotions while in-store, this is a huge opportunity for marketers to capitalize by placing signage prompting customers to engage with their mobile phones to find coupons, special offers, and more. Mobile is where today’s consumers already are but many local businesses aren’t. Statistics continue to illuminate that consumers are increasingly using mobile devices for local information and these statistics will continue to increase. SMBs will continue playing an ongoing game of catch-up to capitalize on today’s local media landscape which includes social media, online search, daily deals, and now mobile. Unlike any other advertising or marketing medium, mobile represents an exciting new opportunity for businesses to directly engage with these consumers who always have their devices on and near them. It’s so easy to reach out and convert as the statistics show – do so before your competitor does! Can we show you how to improve your business with a mobile marketing strategy? This entry was posted in Mobile, Mobile Search, Websites and tagged mobile search, mobile SEO on October 10, 2013 by Dan League.